This document will go through how you as a user can work with the group node, the logic behind it and all the technical aspects that finally got this result. To make a “perfect” result it might be so that you add your own input to your material, but I think this group node will cover most basic needs anyway. Some lines/stripes going in a vertical direction. Color variation that often lays in a horizontal direction, like yellowish on top going towards red in the middle and then perhaps it goes to a more yellow color again in the bottom. A mix of stripe and main color. More general variation of colors. Here also aging of apples comes in play, so a third color must be used on many cases. Then some distortion on stripes and colors of course. All this things vary a lot of course. 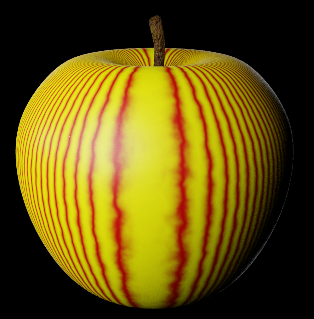 Some apples have almost no stripes, while others have them clearly visible and so on. The trick here will be to control the surface to provide just the correct amount of color, stripes and dots visible. 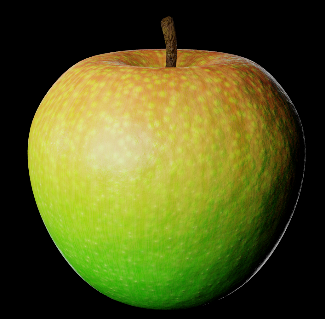 Even if I build a node tree specific for only one apple, it will be a lot of parameters that I would need to change, thus I need a way to simplify it. The answer is to make a group node. 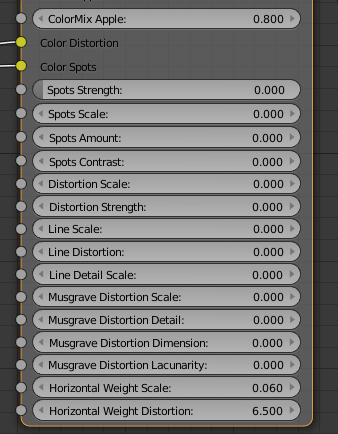 Then I only see the parameters needed to change and I also have much clearer names on every parameter. 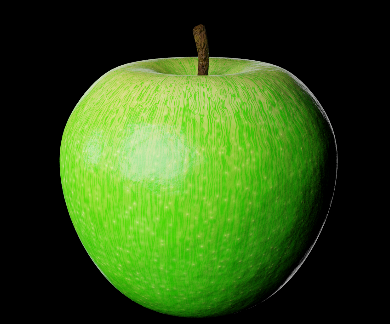 One additional advantage then also will be the fact that I can use it in a more flexible way, allowing that the same node setup could be used on several types of apples. 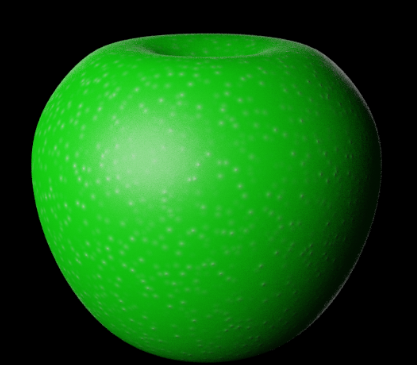 It could even be so that the apples shape, structure and color could be generated by random. 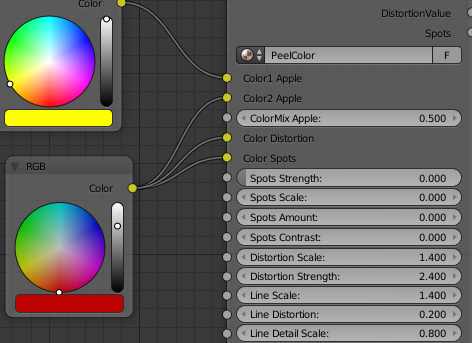 The group node designed is called “PeelColor”. It has about 15 different parameters and before start using them it could be good to know how to work them. There are also a few outputs of course. Since it can be overwhelming just fiddling with everything and get it to work, I will divide every sub chapter into these specific bullets points I mentioned above so that you know what controls the spots, the stripes and so on. You also have an output for “Spots” if you would like to bump them a bit. 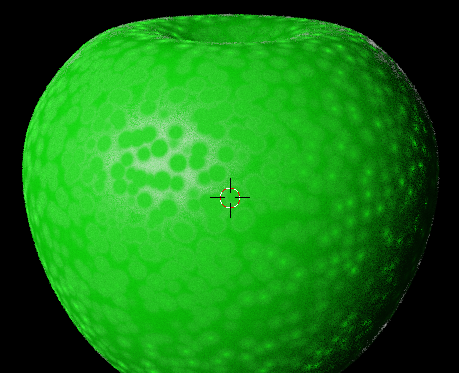 If you set spots Strength to 0, you of course will not get any spots on the apple. 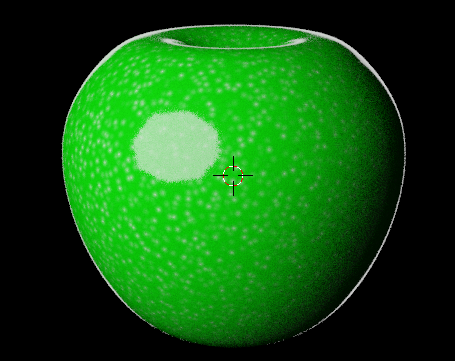 However, the “Spots” output will still tell you where they will be, so you can enhance them just using a bump vector if that is suitable for the apple you are doing. A higher scale of the spots will give smaller spots. 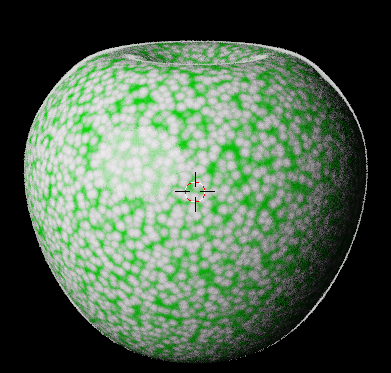 I would suggest a value between 20 to 60, depending on type of apple, to get a nice size of the spots. 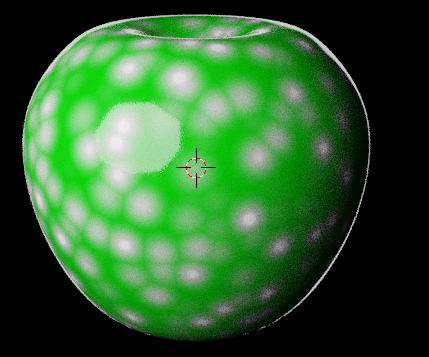 However, it’s not only the scale that changes the size of the dots in this group Node. The end size depends of amount as well. 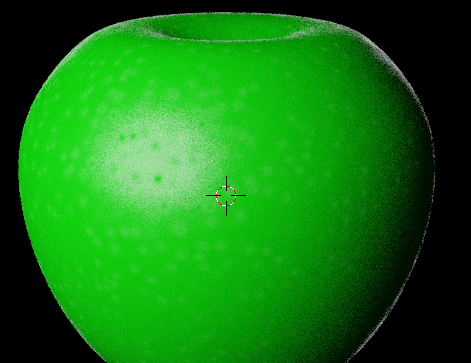 The size will go down a bit if using fewer amounts of dots. As you can see the size has decreased even if the scale remained the same, so you have to mix scale and amount in a good way to get what you are looking for. 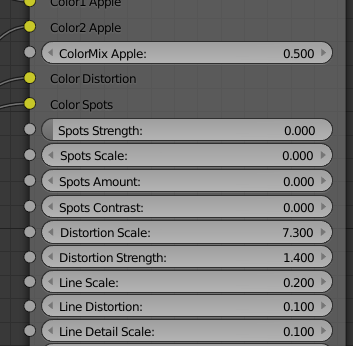 The reason I built it like this is that you now also have a third parameter… softness! After checking the ref. images I saw that you will never have a few large hard spots… they will always be soft in the edges, while smaller ones can be a bit harder. With this knowledge most types of spots can be created. Now…if you still want your dots or spots to be very visible and decrease the softness a bit, then just increase the contrast. Here is an example of 10. 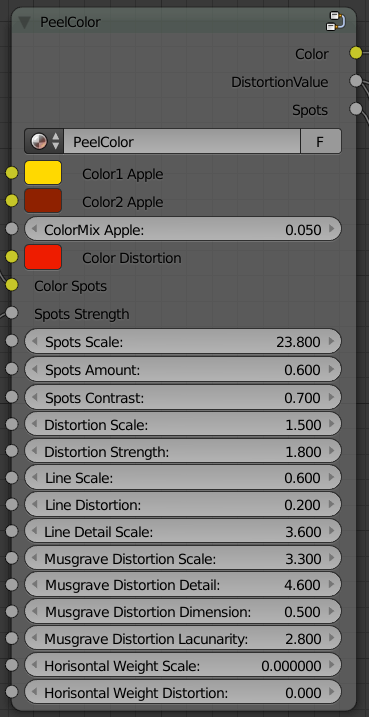 Finally you can also decide how much you want the spots to blend into the main material using the spots Strength. Now you can see the effect! It has not to be much at all. In this case I used a distance of 0.05 and it can a number of time be even less. However, bump is not all. 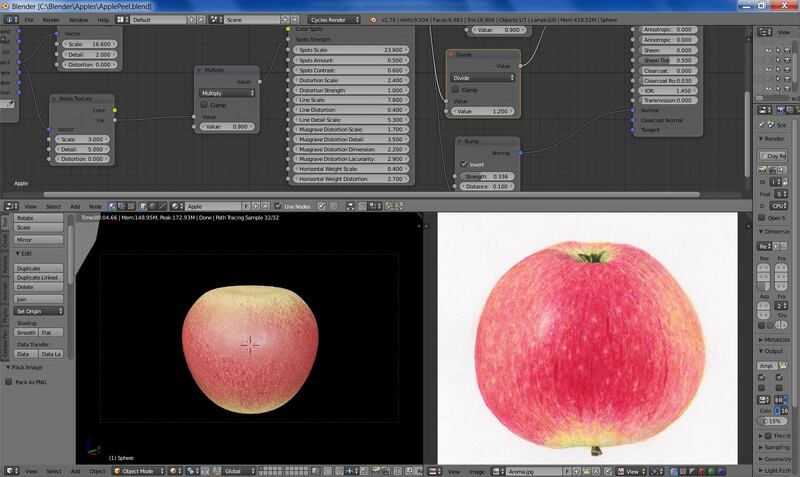 To get a good looking apple you also have to change the gloss/roughness for the bumps compared to the apple itself. Some cases could be that you are only using the roughness without color or bump. 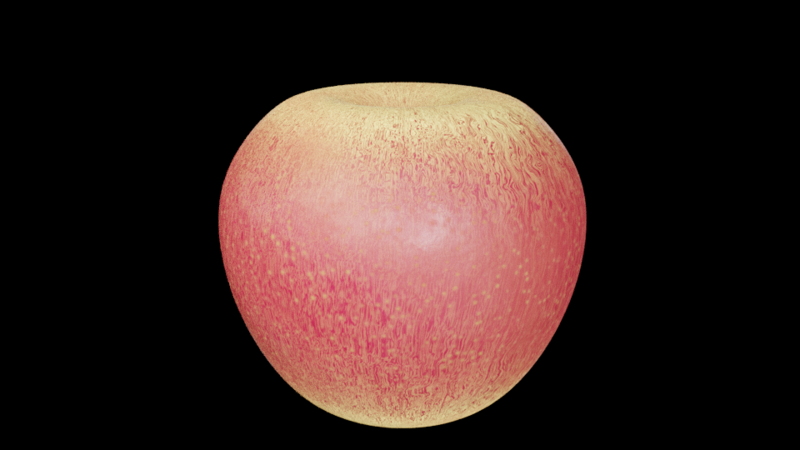 You can clearly see the spots…even if they don’t differ in color or have any bumps, because they are less shiny than the rest of the apple. 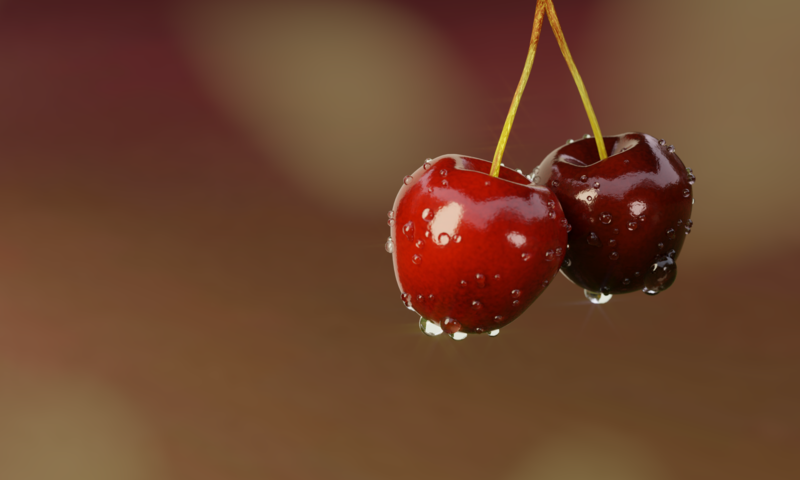 If they should be less or more shiny depends on type of apple. 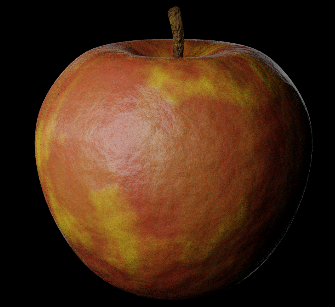 Also on some apples the bumps go inwards. 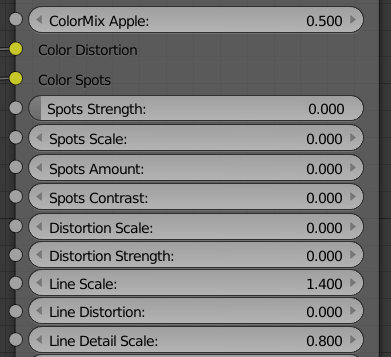 The total output value to give to bump and/or roughness is controlled by the parameter “Spots contrast”. With a high contrast, you get high output numbers and with a low…you get a low output. You clearly see the difference :). Ok, so now you know a bit about the dots, so the next natural thing to handle is the stripes. 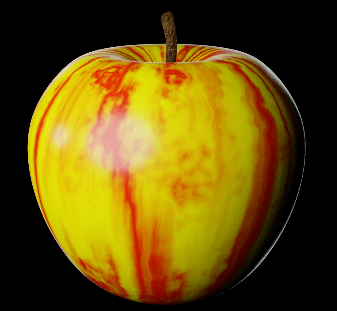 To create stripes we need one color for the stripes and one for the main apple. 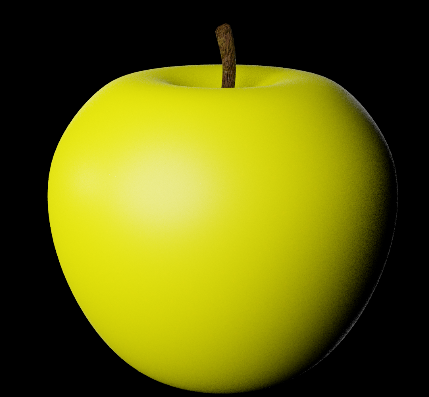 As you can see of the result you will get a yellow apple. 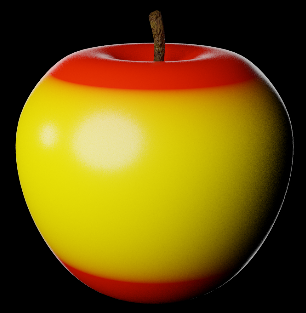 This follows pure Blender Logic, so a ColorMix of zero gives Yellow in this case and a ColorMix of 1 gives a red apple here. Since we use some math behind the curtains you can go below 0 and above 1 and it will affect the mix a bit as well, but standard is between 0 to 1. Now we have the stripes in place. 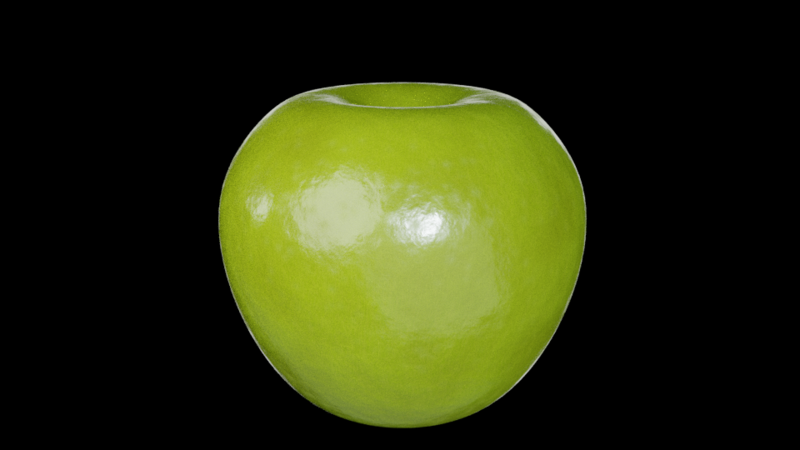 Do you feel it… the apple color? 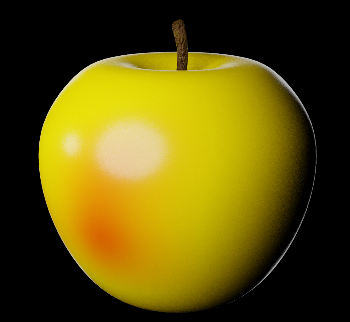 Yes, it feels much more like an apple now. 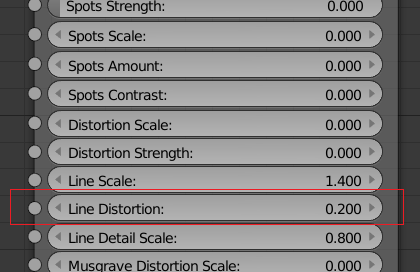 The “Line Detail Scale” will spread or scatter the existing lines more, so normally you can use rather low number in “Line scale” and then spread it by increasing the level of detail. 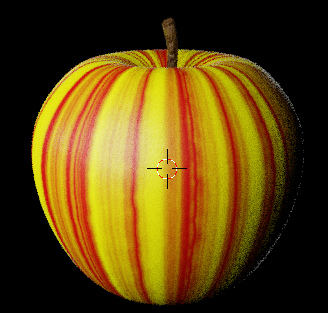 If you want the yellow to be stripe and the red the main apple, then just change the ColorMix towards a low number like 0.2 or so…and vice versa if you want even more yellow in it. As you can see we have now turned the lines to be almost horizontal. I use a high amount of distortion to achieve it and normally I don’t think you will use this high number, but now you have a clue at least. 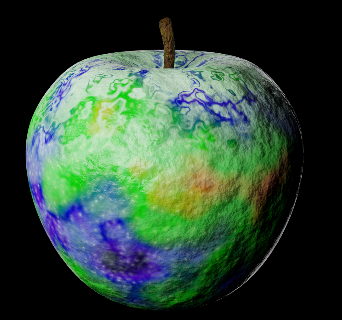 As you can see, the lines are now more floating down the apple. The direction changes a bit vertical as described earlier when using the line distortion. In what direction the angle will go towards the vertical is depending whether you add a negative or positive number as distortion. Now the lines are very visible and the contrast between the main color and the stripes is huge. 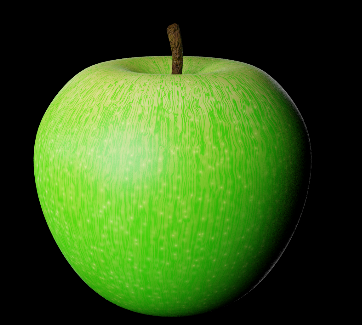 That means that it does not look like an apple. 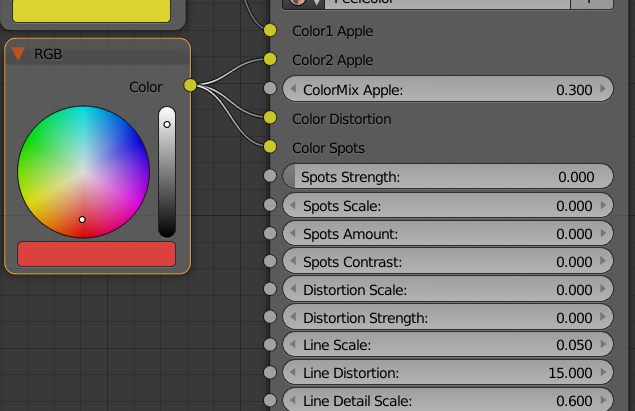 You can select colors that are closer to each other and you can also change the mix a bit to get it better, but you will always feel that something is missing, so let me introduce the more general distortion. 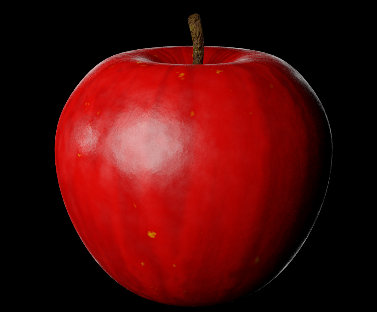 As I wrote above, we need something more to make an apple look good. 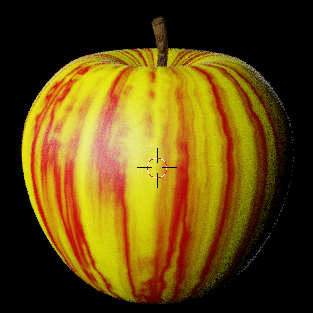 Distortion is the answer to almost everything that should look realistic, so this shader comes with two types of distortions. 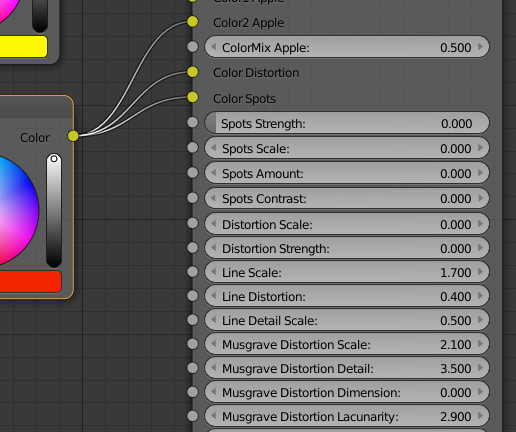 One Distortion is built on the noise texture and one on the texture that is called “Musgrave”. 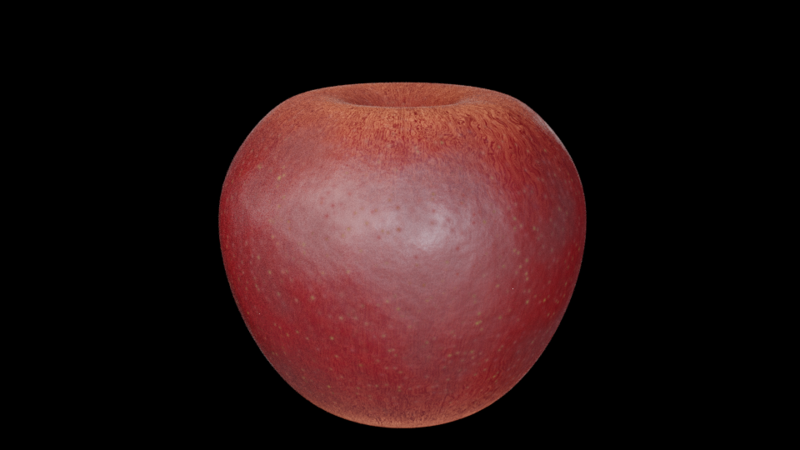 Together with the lines and the spots they can handle the most variations demanded from different apples. You have two types of distortion to use, if you exclude the line distortion. 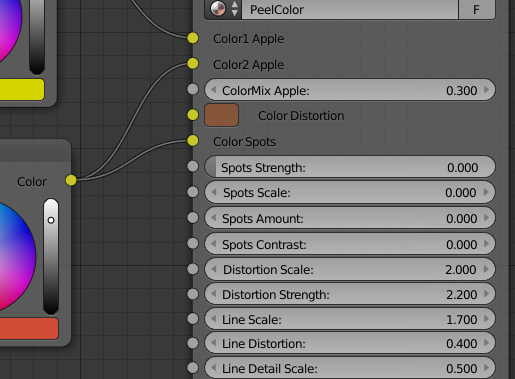 The color for Distortion is also connected to this distortion. 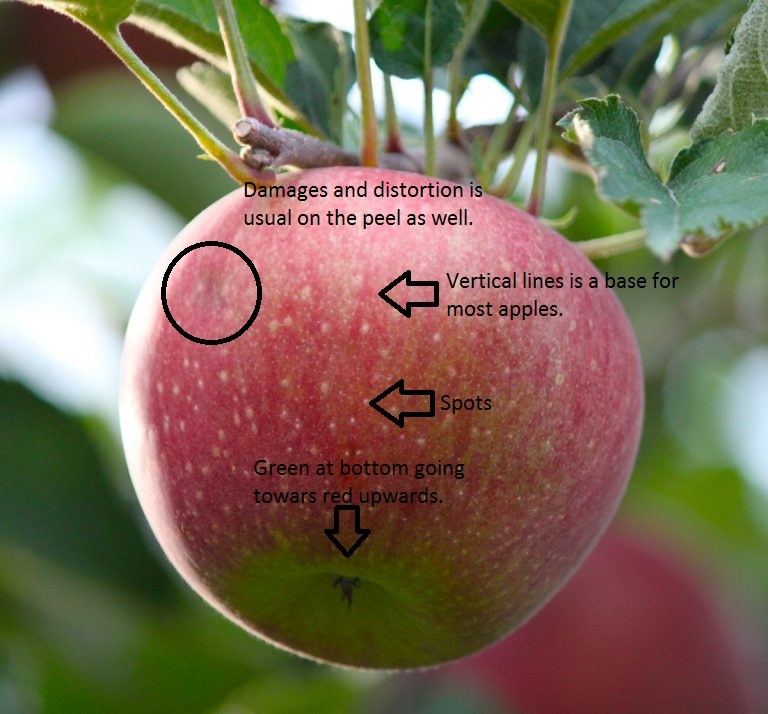 A low “Distortion scale” will create large areas on the apple while a high “Distortion scale” will create smaller areas of distortion. How hard the distortion will be in color and output for the bumps is decided by the “Distortion Strength”. Have you seen this “wow” result?! 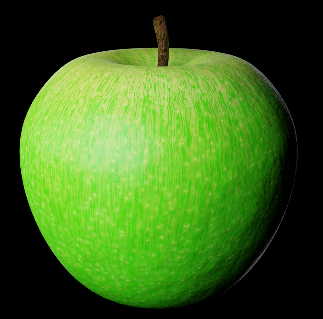 This is an apple! We are still very high in contrast between the yellow “Main color” and the red stripes, but when we now use the distortion it will act as a layer above and merge into the other colors. The result is a soft tone between the colors. In this case we only use two colors, since the “Color Distortion” is using the same red as the stripes. 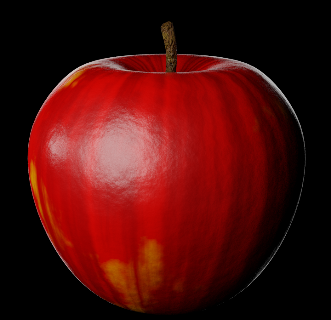 However, since the colors are added to each other it will darken underlying red. 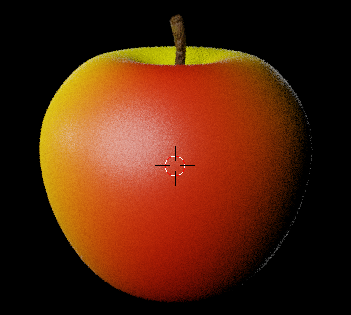 I have added the bump vector to the apple, so that you can see how it also affected the end result of the apple. As you can see there are new a few yellow spots as well. This makes it more believable. Only bump Distortion, don’t want any color change. If you just want to have the bumps in place, then that is very easily fixed. Just put the Distortion Color to completely white and it will not be mixed with the other two colors. However, the output will still deliver a bump value that you can use. The other type of distortion you have is the Musgrave distortion. This distortion uses the same color as the stripes (Color2). 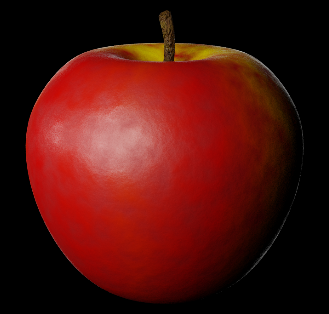 It can be used for plenty, but mostly I use it for getting old spots behind the skin of the apple. Lacunarity shapes it in to harder smaller areas when it goes up. Below 1 you will hardly notice anything, but when it comes to 3 to 5 in value it will be very visible. The dimension sets how fluffy and big an area should be. No dimension = sharp and small. You can now see that the stains are weaker and smoother. 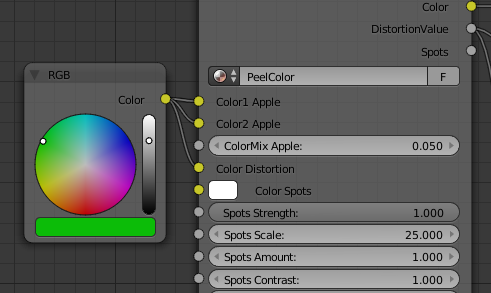 So, you can by the dimension decide how visible the stains should be in the peel. 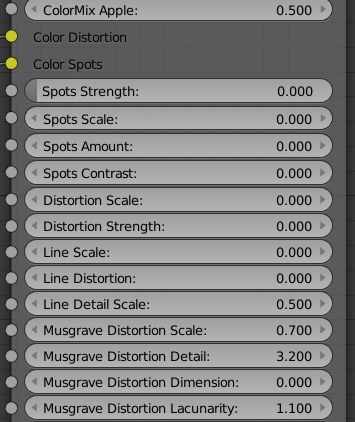 …but the ColorMix will lower the amount for both stripes and Musgrave while the dimension parameter only will affect the Musgrave. 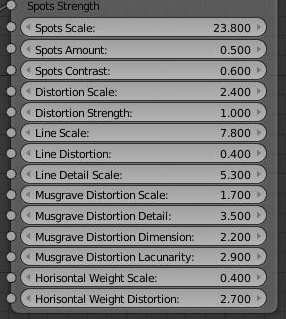 As with noise distortion, you have to test a lot to understand the concept of how it will distort things… but now you know the basics. The weight scale sets how many horizontal lines you want. Normally this is low. 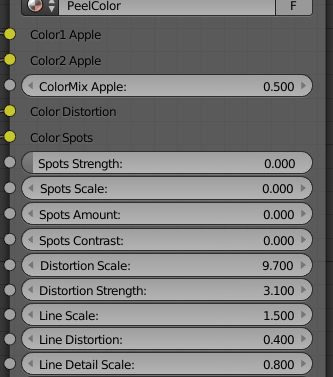 With the distortion parameter you can move the lines up and down and make them mix a bit differently with the other distortions and ColorMix parameters that you have. As you can see I get a smooth red top that slowly goes towards yellow at the bottom. 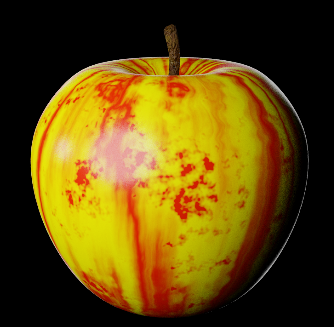 Even if my apple image looks like it’s carved in wood and painted on the image above you get the picture. The force is in combining all these parameters! 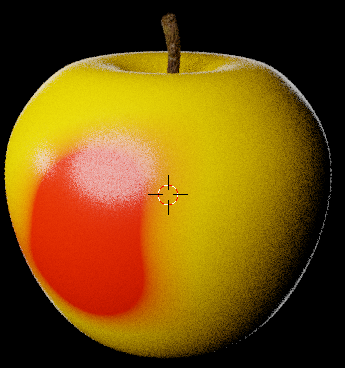 To make an apple (or any other object) look real, you must have some variation in your roughness. 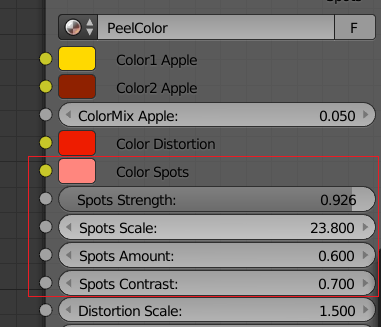 To achieve that you can use the two output values “DistortionValue” and “Spots”. 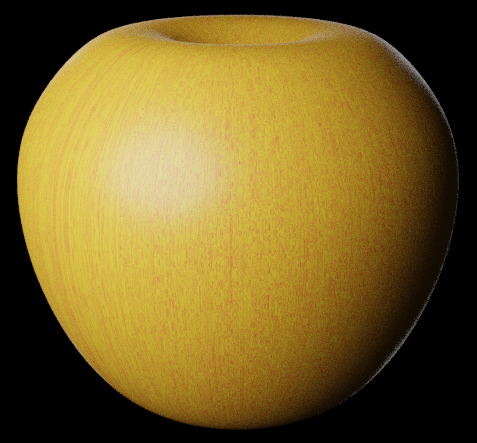 This looks like an apple, but it lacks that final touch with bumps and structure. Let’s start with the structure. If you compare it with the previous image, you can see that it got some structure now. 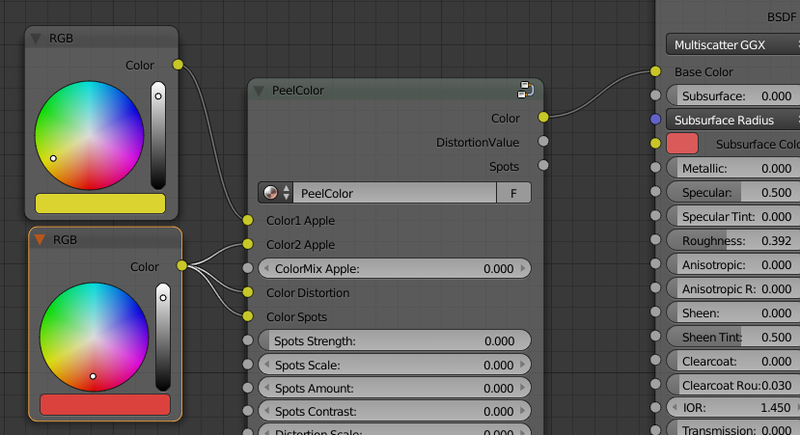 The same nodes… but with slightly different settings could be used for all types of apples. 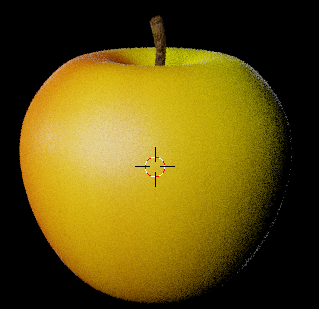 The only thing left is to also add some variable roughness. 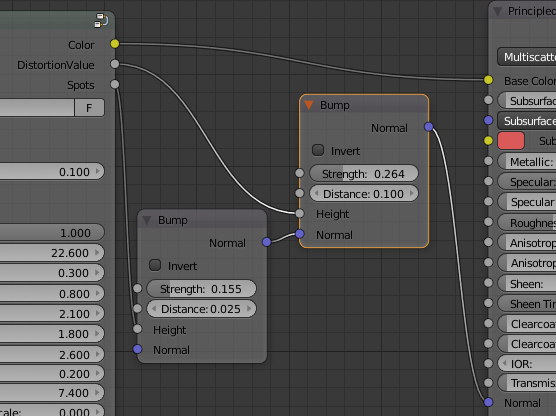 To make that work I’ll use the same output nodes, but connect two math nodes to them. One math node will be “Multiply”. Here you control the difference between high and low roughness. A High value in this math node will make a big difference in high and low value. The other math node will be an “Add”. This is to set the basic roughness. 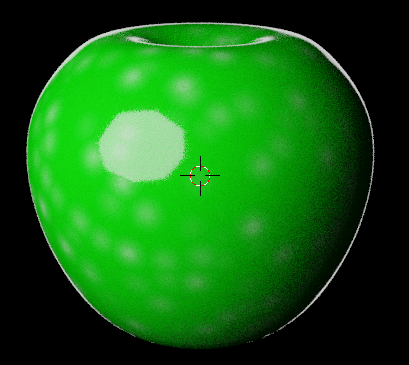 Since I will make a rather shiny apple, I put the value in “add” low. 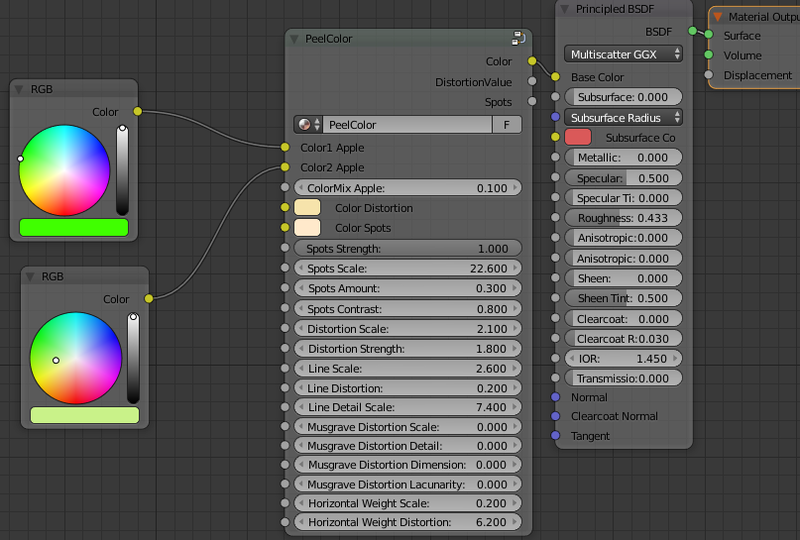 The variations are not that big between gloss and roughness, so also the multiply node will get a small value. 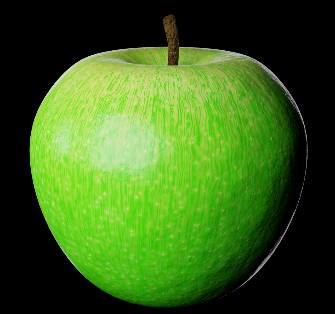 The apple is now more alive. 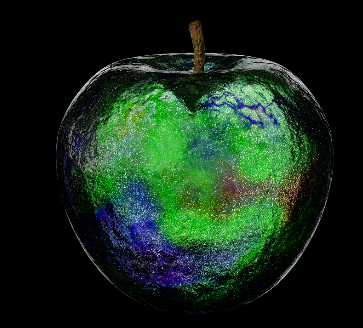 It can be that I have used a little too high value on the distortion, but anyway…this is the result. It will not make that much of a difference, but also the subtle changes are needed. Beware that my setup above will get the spots to also affect the original roughness, so in the case here the complete apple will get a tiny bit more gloss since the end value for roughness will be lower if subtracting from it. Congratulation!! 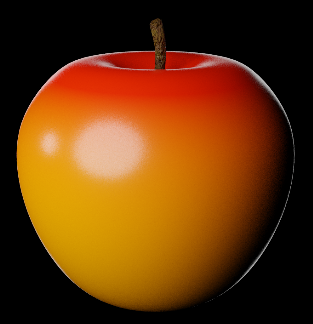 Now you know how to use the apple shader! To make full use of this Group Node, you should look at it as any node. 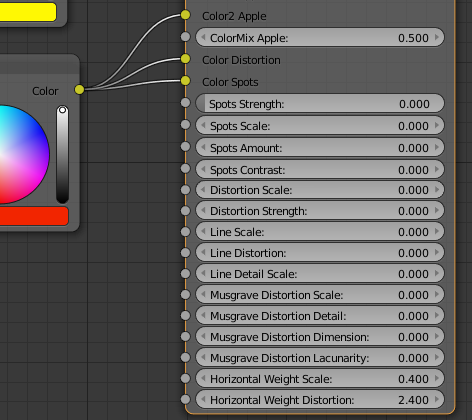 You can input different textures, colors and values in all the input nodes so if you need more colors than the Group Node gives then just create a colorramp with many colors connected to noise texture or similar. 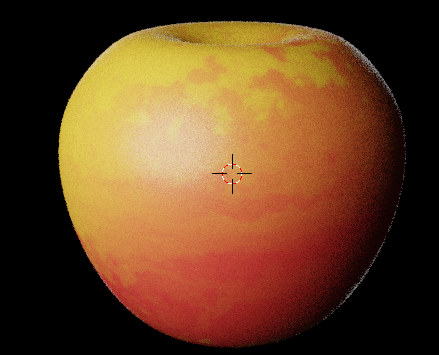 You can clearly see that it is using two shaders. The top has big spots visible, while the lower has more and smaller. There are also more bumps on the top, other colors and so on. What I did, was just to duplicate what I had and then change parameters on one. 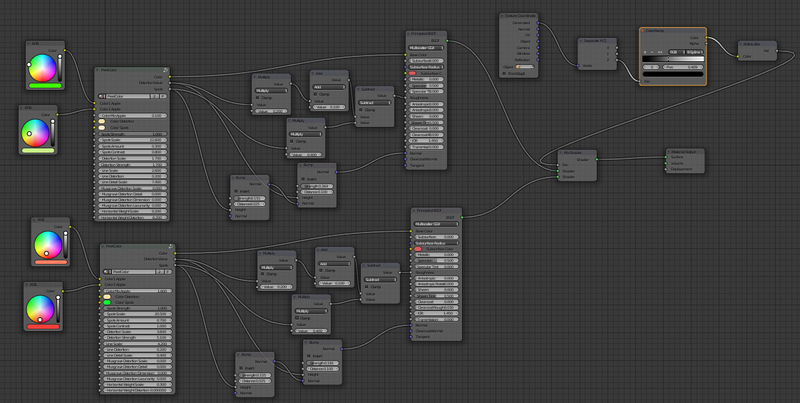 I will show the node setup on distance, because the amount… but I think you understand the logic on how to do it. 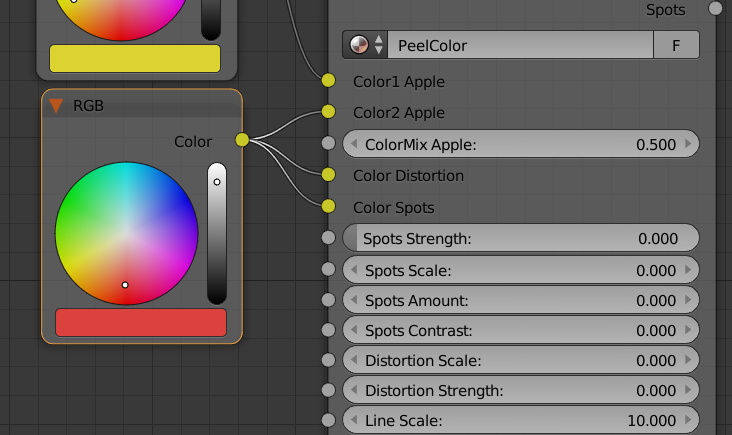 So, as you understand there are unlimited possibilities, but the basic PeelColor Group Node will help you almost all the way to create great apple peels.